The color of the Universe? 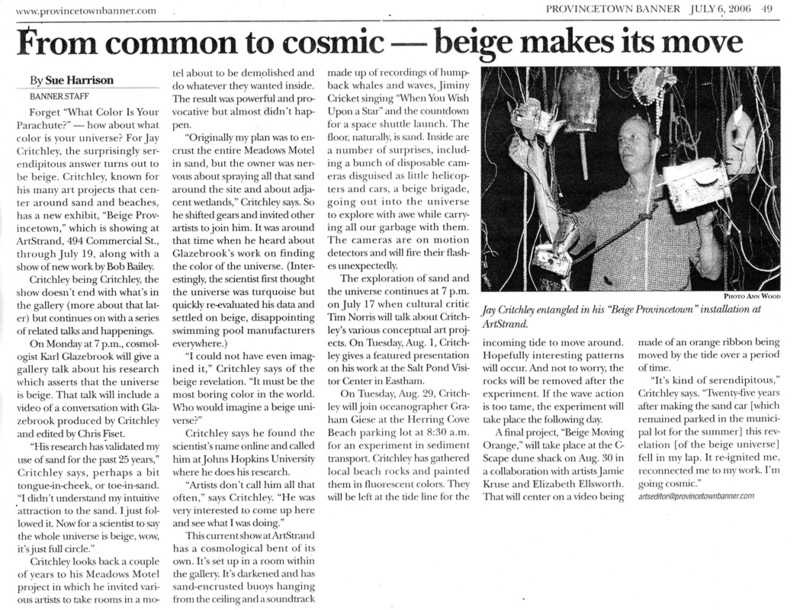 ​BEIGE PROVINCETOWN project explores the connection between the beige sand of Provincetown and the recently discovered color of the Universe: an exciting BEIGE! Beige Provincetown continues Jay’s twenty-five year exploration of sand and the cosmological link between its beige color, the light and the color spectrum, and the beige color of the universe. The use of sand began with the artist’s debut “sand car series” in Provincetown’s waterfront parking lot from 1981-1984 − “Just Visiting for the Weekend” − with sand-encrusted cars, sand-filled cars, sand-blasted cars, and the “sand family”. This ongoing exploration has guided him to the recent research which determined the color of the universe is beige, discovered by physicists Karl Glazebrook and Ivan Baldry of John’s Hopkins University.